Kenneth N. Stevens (March 24, 1924 – August 19, 2013) was the Clarence J. LeBel Professor of Electrical Engineering and Computer Science, and Professor of Health Sciences and Technology at the Research Laboratory of Electronics at MIT. Stevens was head of the Speech Communication Group in MIT's Research Laboratory of Electronics (RLE), and was one of the world's leading scientists in acoustic phonetics. He was awarded the National Medal of Science from President Bill Clinton in 1999, and the IEEE James L. Flanagan Speech and Audio Processing Award in 2004. He died in 2013 from complications of Alzheimer's disease. Ken Stevens was born in Toronto on March 23, 1924. His older brother, Pete, was born in England; Ken was born four years later, shortly after the family immigrated to Canada. His childhood ambition was to become a doctor, because he admired an uncle who was a doctor. He attended high school at a school attached to the Department of Education at the University of Toronto. Stevens attended college in the School of Engineering at the University of Toronto on a full scholarship. He lived at home throughout his undergraduate years. Though Stevens himself could not fight in World War II because of his visual impairment, his brother was away for the entire war; his parents tuned in nightly to the BBC for updates. 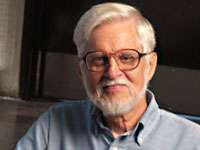 Stevens majored in engineering physics at the university, covering topics from the design of motorized machines through to basic physics, which was taught by the physics department. During summers he worked in the defense industry, including one summer at a company that was developing radar. He received both his S.B. and S.M. degrees in 1945. Stevens had been a teacher since his undergraduate years, when he lectured sections of home economics that involved some aspect of physics. After receiving his master's degree, he stayed at the University of Toronto as an instructor, teaching courses to young men returning from the war, including his own older brother. He was a fellow of the Ontario Foundation from 1945 to 1946, then worked as an instructor at the University of Toronto until 1948. During his Master's research Stevens became interested in control theory, and took courses from the applied mathematics department, where one of his professors recommended that he should apply to MIT for doctoral studies. Shortly after Stevens was admitted to MIT, a new professor named Leo Beranek noticed that Stevens had taken acoustics. Beranek contacted Stevens in Toronto, to ask if he would be a teaching assistant for Beranek's new acoustics course, and Stevens agreed. Shortly after that, Beranek contacted Stevens again to offer him a research position on a new speech project, which Stevens also accepted. The Radiation Laboratory at MIT (building 20) was converted, after the war, into the Research Laboratory of Electronics (RLE); among other labs, RLE hosted Beranek's new Acoustics Lab. In November 1949, the office next to Ken's was given to a visiting doctoral student from Sweden named Gunnar Fant, with whom he formed a friendship and collaboration that would last more than half a century. Stevens focused on the study of vowels during his doctoral research; in 1950 he published a short paper arguing that the autocorrelation could be used to discriminate vowels, while his 1952 doctoral thesis reported perceptual results for vowels synthesized using a set of electronic resonators. Fant convinced Stevens that a transmission-line model of the vocal tract was more flexible than a resonator model and the two published this work together in 1953. Ken credits Fant with the association between the Linguistics Department and the Research Laboratory for Electronics at MIT. Roman Jakobson, a phonologist at Harvard, had an office at MIT by 1957, while Morris Halle joined the MIT Linguistics Department and moved to RLE in 1951. Stevens' collaborations with Halle began with acoustics, but grew to focus on the way in which acoustics and articulation organize the sound systems of language. Stevens defended his doctoral thesis in 1952; his doctoral committee included his adviser Leo Beranek, as well as J. C. R. Licklider and Walter A. Rosenblith. After receiving his doctorate, Stevens went to work at Bolt, Beranek and Newman (now BBN Technologies) in Harvard Square. In the early 1950s, Beranek decided to retire from the MIT faculty in order to work full-time at BBN. He knew that Stevens loved to teach, so he encouraged Stevens to apply for a position on the MIT faculty. Stevens did so, and joined the faculty in 1954. Stevens is best known for his contributions to the fields of Phonology, speech perception, and speech production. Stevens' most well-known book, Acoustic Phonetics, is organized according to the distinctive features of Stevens' phonological system. Stevens is perhaps best known for his proposal of a theory that answers the question: Why are the sounds of the world's languages (their phonemes or segments) so similar to one another? On first learning a foreign language, one is struck by the remarkable differences that can exist between one language's sound system and that of any other. Stevens turned the student's perception on its head: rather than asking why languages are different, he asked, if the sound system of each language is completely arbitrary, why are languages so similar? His answer is the quantal theory of speech. Quantal theory is supported by a theory of language change, developed in collaboration with Samuel Jay Keyser, which postulates the existence of redundant or enhancement features. The quantal theory suggests that the phonological inventory of a language is defined primarily by the acoustic characteristics of each segment, with boundaries specified by the acoustic-articulatory mapping. The implication is that phonological segments must have some type of acoustic invariance. Blumstein and Stevens demonstrated what appeared to be an invariant relationship between the acoustic spectrum and the perceived sound: by adding energy to the burst spectrum of "pa" at a particular frequency, it is possible to turn it into "ta" or "ka" respectively, depending on the frequency. Presence of the extra energy causes perception of the lingual consonant; its absence causes perception of the labial. Stevens' recent work has re-structured the theory of acoustic invariance into a shallow hierarchical perceptual model, the model of acoustic landmarks and distinctive features. While on sabbatical at KTH in Sweden in 1962, Stevens volunteered as a participant in cineradiography experiments being conducted by Sven Öhman. Stevens' cineradiographic films are among the most widely distributed; copies exist on laserdisc, and some are available on line. After returning to MIT, Stevens agreed to supervise the research of a dentistry student named Joseph M. Perkell. Perkell's knowledge of oral anatomy permitted him to trace Stevens' X-ray films onto paper, and to publish the results. Other contributions to the study of speech production include a model by which one can predict the spectral shape of turbulent speech excitation (depending on the dimensions of the turbulent jet), and work related to the vocal fold configurations that lead to different modes of phonation. Stevens joined MIT as an assistant professor in 1954. He became an associate professor in 1957, a full professor in 1963, and was appointed as the Clarence J. Lebel Chaired Professor in 1977. One of his long-time collaborators, Dennis Klatt (who wrote DECtalk while working in Stevens' lab), said that "As a leader, Ken is known for his devotion to students and his miraculous ability to run a busy laboratory while appearing to manage by a principle of benevolent anarchy." The first doctoral thesis Stevens signed at MIT was that of his fellow student, James L. Flanagan, in 1955. Flanagan started graduate school at MIT in the same year as Stevens, but without a prior master's degree; he earned his M.S. in 1950 under Beranek's supervision, then finished his doctoral thesis under Stevens' supervision in 1955. Stevens estimated in 2001 that he had supervised approximately forty Ph.D. candidates. Stevens was active in the Acoustical Society of America since his time as a graduate student. He was a member of the executive council from 1963 to 1966, Vice President from 1971–2, and President of the Society from 1976-7. He is a Fellow of the ASA. In 1983 he received its Silver Medal in Speech Communication, and in 1995 he received the Gold Medal from the society. Stevens was also active in the IEEE, where he held the rank of IEEE Life Fellow. In 2004, Ken Stevens and Gunnar Fant were the joint first winners of the IEEE James L. Flanagan Speech and Audio Processing Award. Stevens was a Fellow of the American Academy of Arts and Sciences, a member of the National Academy of Engineering, a member of the National Academy of Sciences, and a 1999 recipient of the United States National Medal of Science. ↑ "MIT Speech Communication Group". 1 2 3 4 "Acoustical Society of America Gold Medal Award, 1995: Kenneth N. Stevens". 1 2 3 4 5 6 7 8 "AIP Oral History Transcript — Dr. Kenneth Stevens". 1 2 3 "D. Halber, "RLE Professor Kenneth Stevens wins National Medal of Science," January 1, 2000". 1 2 3 "Sensimetrics Consulting Resume, Kenneth N. Stevens". ↑ "Gunnar Fant, "Phonetics and Phonology in the Last 50 Years," Presented at "From Sound to Sense: 50+ Years of Discoveries in Speech Communication," June, 2004" (PDF). ↑ "K.N. Stevens, "Autocorrelation analysis of speech sounds," J. Acoust. Soc. Am. 22:769-771, 1950". ↑ "K.N. Stevens, "The perception of sounds shaped by resonant circuits," 1952". ↑ "Stevens, K. N., Kasowski, S. and Fant, G. (1953) An electrical analog of the vocal tract, Journal of the Acoustical Society of America 25, 734-742". ↑ Halle, Morris; Kenneth N. Stevens (1959). "Analysis by synthesis." Proc. Seminar on Speech Compression and Processing. Vol. 2. ↑ Stevens, Kenneth N.; Morris Halle (1967). "Remarks on analysis by synthesis and distinctive features." Models for the perception of speech and visual form, pp. 88-102. ↑ Halle, Morris; Kenneth N. Stevens (2002) [First printed in 1971]. "A note on laryngeal features," pp. 45-61. ↑ Halle, Morris; Kenneth N. Stevens (1979). "Some reflections on the theoretical bases of phonetics." Frontiers of speech communication research, pp. 335-349. ↑ K.N. Stevens (2000). "Acoustic Phonetics". MIT Press. ↑ K.N. Stevens (1968). The quantal nature of speech: evidence from articulatory-acoustic data. ↑ K.N. Stevens; S.J. Keyser (1989). ""Primary Features and their Enhancement in Consonants," Language 65(1):81-106". ↑ S.E. Blumstein; K.N. Stevens (1979). ""Acoustic invariance in speech production: Evidence from measurements of the spectral characteristics of stop consonants," J. Acoust. Soc. Am. 66(4):1001-1017". ↑ S.E. Blumstein; K.N. Stevens (1980). ""Perceptual invariance and onset spectra for stop consonants in different vowel environments," J. Acoust. Soc. Am. 67(2):648-662". ↑ "Ken Stevens x-ray film on youtube". ↑ Joseph S. Perkell (1969). "Physiology of Speech Production: Results and Implications of a Quantitative Cineradiographic Study (Research Monograph)". ↑ "Vocal Fold Physiology, 1980, Minoru Hirano and Kenneth N. Stevens, eds.". ↑ "From Sound to Sense: 50+ Years of Discoveries in Speech Communication". May 11, 2004. ↑ Frederik Nebeker (8 April 1997). "IEEE Oral-History:James L. Flanagan". ↑ "Past and Present Officers and Members of the Executive Council, Acoustical Society of America". ↑ "Emilio Segre Visual Archives, Gallery of Member Society Presidents". ↑ "IEEE Global History Network, Kenneth N. Stevens". ↑ "NAE Members: Dr. Kenneth N. Stevens". ↑ "Alberts Issues Challenge to New NAS Members". The Scientist. June 8, 1998.